As a wedding photographer, I always want close clouds at sunset, especially if there is a lake as the back drop. Clouds are what provide the magical sunset color we all want on a wedding day. On this day, we had the clouds but no magic, as they slipped in shortly after sunset. My bride had grown up in Raleigh and spent her childhood summers here at Lake Gaston. The family had chosen this spot as their wedding venue because it held so many memories for them. The bride and groom had flown in form their home in San Francisco just a couple days earlier. We met the next day and went through their wedding day plans including the bride's requests for images with certain backdrops. Their day started out as a warm and sunny June day. The couple got ready in separate locations, but came together for a "First Look" session about 2 hours before the wedding. We hit several series of images using the different backdrops they requested. 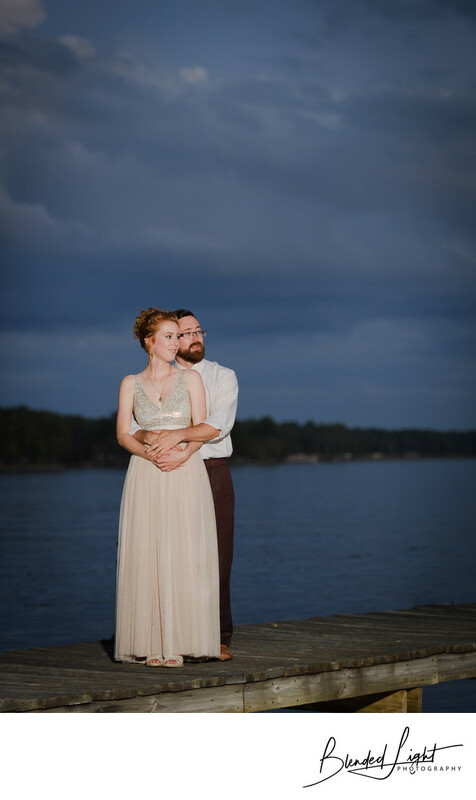 As they went their separate ways again, I had the chance to talk with my groom and he opened up about how much it meant to his soon-to-be-wife to be getting married there at the lake and many fond memories of being out on the water. I knew I had to create something with the water in it. The bridal party came across Lake Gaston on a pontoon boat, walking up the dock to the tent covered area where the ceremony was being held with guests waiting. The ceremony was short lasting maybe 15 minutes. We spent the next 1/2 our or so working through the formals with family and the bridal party. Once done the couple went on to start the festivities with their cake cutting and dinner. Dinner coincided with sunset, so my attention was more to the skies and whether nature would cooperate with some glowing skies. The sun set quickly without event. However, the distant horizon showed some thick clouds coming. I decided this would be my best chance. While the couple ate dinner, I set up my light to fire across the pier with them facing towards it. I choose this view to minimize background distractions. Had they turned the other way, there were all sorts of boats, piers and house lights to contend with. We tried a couple different poses, but this one worked the best. With the couple standing closely together I had them turn their heads slightly to look out over the lake as if they were gazing into their future. it almost has a "Titanic" feel to it. This was a beautiful small wedding with a host of guests from across the nation, many staying at houses in the nearby area. Even without the sunset we had all hoped for, the day was filled with colorful personalities and plenty of warmth. Lake Gaston is located in northeastern North Carolina and shared with Virginia. In addition to being a tourist hotspot and home for close to 150,000 residents, Lake Gaston is best known for being a hydroelectric reservoir and having strict regulations regarding the water levels in the lake. 1/100; f/2.8; ISO 800; 105.0 mm.